We offer a variety of high quality awards for all your recognition needs. Whether you need a corporate award, employee of the month recognition plaque, school/team/club awards or just want to present a token of thanks to that special group or individual, Northwoods Laser & Embroidery produces endless possibilities in awards, plaques or engraved gifts to commemorate that special occasion. Awards usually ships within 7-10 business days from receipt of artwork but rush orders can also be accommodated. Checkout the following links to some of our awards/gifts suppliers. If you don't see the award or gift you're looking for, please e-mail or call and we'll help you find it or custom design it for you. Contact us for pricing. 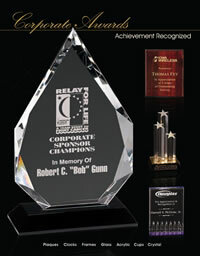 An online catalog featuring many different styles of corporate awards. 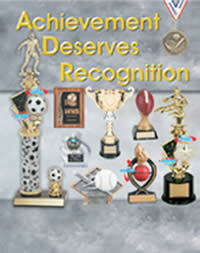 An online catalog featuring many different styles of sport award items.